I'm heading off to Manteo this afternoon for the Inaugural Outer Banks Marathon with the usual suspects. It looks like we will have some nice weather out along the coast of NC. 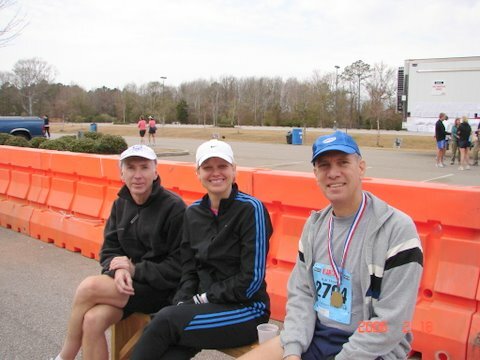 I will be run/walking the race with my #1 training partner and friend Karla. This will be a special event for us as Karla continues to keep a positive attitude while fighting cancer. She began 6 weeks of radiation treatment this past Monday after completing 29 weeks of chemotherapy on Oct. 13th. We know this will be long and slow but we will enjoy the day and the joy of a wonderful friendship. 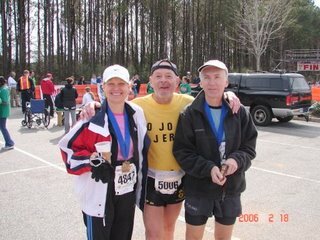 Karla's husband Frank will be running in the half marathon and our friend Mojo Jerry will also be running in the marathon. The race has filed to capacity and I know there will quite a few runners from the NCRC and maybe also few from MTC. I hope to see many of you there. The photos above were taken at the finish line of last February's Myrtle Beach Marathon where I ran my PR and Boston qualifier in 3:35:15. Look for a report when I return.